Christian Frederick Overman married Henrietta Adelaide Lind in Saint Thomas , then a Danish possession, on December 7, 1819. They lived at "Havensight" overlooking Saint Thomas harbor where they owned plantations and a ship named Themis. In the erly 1820s they began selling their properties in Saint Thomas and on April 26, 1827 C. F. Overman bought a sugar plantation in Barrio Las Palmas in Guayama from J. S. Wall for 60,000 hard dollars, 45,000 in cash, he named the estate Henrietta (Enriqueta) in honor of his wife. C. F. Overman died of dysentery at the Henrietta on December 19, 1836. Before he died he had bought a steam engine from B. G. Shutt of Hamburg to operate the mill but it had not been installed at the time of his death. In April 1937, German Rieckehof was appointed by Henrietta Lind as administrator of Charles Frederick Overman's estate which at the time included the Hacienda Henrietta of approximately 800 cuerdas. Rieckehoff's management of the Henrietta was not successful and he was accused of incompetence and worse. He was replaced in 1841 by Henrietta's younger brother Bent Christian Edward Lind, born in Saint Thomas on June 12, 1815.​ Lind's management of the Henrietta was a success, in 1841 production increased 40% and profits were the highest since C. F. Overman's death. ​In his book A Family Plantation - The History of the Puerto Rican Hacienda "La Enriqueta" Charles Theodore Overman states that at the same time he bought the Henrietta, Lind also bought the contiguous Hacienda Concordia and other lands for about 179,000. The combined estate was described as being in "the districts of Palma and Cuatro Calles, bounded on the South by the sea, to the East with the heirs of Santiago Lorenzi and Francisco Javier Olivencia, to the North with the Palma farm of Fantauzzi Bros. and the Emilio (sic) Farm, and to the West by the aforesaid Palma farm, the Cuatro Calles and lands of the heirs of Juan Manuel Cintrón." The Concordia and Henrietta were contiguous properties and during Edward Lind's ownership each one retained its separate legal status although they were commonly referred to as La Enriqueta. Despite the above stated description, the then approximately 1400 acre Hacienda Enriqueta's location has been a subject of debate. Some, including Arroyo Municipal Government tour guides, erroneously say that Enriqueta was in the general area of Punta Guilarte, East of Arroyo close to the shore. The fact it reached the coast is confirmed by C. T. Overman's statement below, however, based on the same information, it is clearly established that the house and the sugar factory were inland on higher grounds. C. T. Overman also states in his book: "The estate commenced at the sea, the land is flat rising gently to the place where the buildings stood - 1 3/8 miles inland. Above this point the land continues its slight rise, and then goes up a little more steeply towards the hills behind." Additionally, during a visit in 1858 by Samuel Morse, he wrote that he saw the buildings from the sea as they approached land, which suggests the buildings were on high ground. He also wrote describing the house as "...a spacious, elegant and most commodious mansion" and the property as: "...a princely estate, and in as fine order as any on the island...a rich and well cultivated estate of some 1,400 acres, gradually rising for two or three miles from the sea shore to the mountains, including some of them, and stretching into the valleys in between them." On March 2, 1859 Morse wrote that he had "...just completed with success the construction and organization of the short telegraph line, the first on the island..." In a similar context he wrote to J. Y. Mason, the US Minister in France; "I have just had the pleasure of completing the first telegraph in this beautiful island, from my son-in-law's house to his place of business on the bay, about two miles." As additional verification to the abobe, Gloria Tapia Rios states in her book La Central Lafayette: Riqueza, Desarrollo y Politica en el Sureste de Puerto Rico states that Enriqueta was adjacent to Hacienda Emilia and Hacienda Palma owned by Fantauzzi Hnos., both of which were adjacent to Central Lafayette which is NE of Arroyo. The State Historic Preservation Office attached to the Office of the Governor of Puerto Rico published a document on the Archeological Sites in the Municipality of Arroyo dated March 4, 2015 which includes a survey with the location of the sites it identified. The site identified as AY0200012 is that of Hacienda Enriqueta. The Technical Sheet with all the information regarding this site clearly established the site of Hacienda Enriqueta at Lat/Long N 17 58 47.3, W 66 02 31.8 which is 2 miles NW of the town of Arroyo port area and 1.3 miles N of Punta Guilarte, today lying N of PR-3. 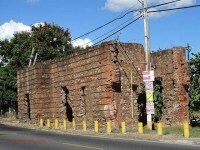 The remaining ruins include only a rectangular structure and a series of brick walls and foundation of what used to be the sugar factory. The house located nearby was destroyed in the earthquaqe of November 18, 1867 . Another indication the sugar factory was NE of the town of Arroyo was identified in our search at the Archivo Historico de PR. In 1860 a water permit was granted by the government to Edward Lind to take water for irrigation from the Quebrada Ancones. Although the creek is not identifiable in today's maps, it is reasonable to believe that it was near where the Barrio Ancones is N of where the site is identified in the survey above. Edward Lind died in May, 1882 more or less insane over the worry over his financial problems, he left his entire estate to his wife Susan. By 1885 Susan had lost her mind mainly due to her son's Charles suicide in 1880. On September, 1885 the Blohms and the Aldecoas who were the main creditors of the Henrietta and the Concordia came to an agreemnet with Susan whereby the Blohms took over the Henrietta and the Aldecoa's the Concordia. On December, 1885 Susan commited suicide by throwing herself overboard on the way to the USA. In December, 1893 Axelina Murdoch, the wife of Juan Carlos McCormick and a niece off Edward Lind purchased Henrietta, by 1913 the Henrietta had been sold in smaller parcels and only 13 acres remained in the name of then 87 year old Axelina. 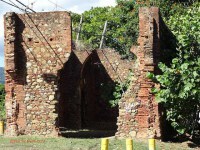 According to historian Cristobal Sanchez in his first "Cartilla Historica de Arroyo" the stucture known as "The Old Church" belonged to Juana Rodriguez Rivera, a rich landowner that built it to achieve her spiritual needs and to serve as cemetery for family members. However, Juana returned to Spain in 1849 before the church was finished. It is possible though not verified, that the hacienda owned by Juana was among those acquired by Lind in 1952 together with Henrietta and Concordia. We have included some pictures of the remains of the "Old Church" given its historic significance and the possiblity it was at one time located within the lands of the Henrietta. 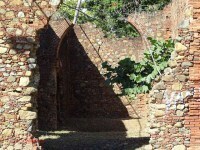 We have also included pictures of the house that remains of what was Hacienda Concordia which as stated above, in 1852 was consolidated with Henrietta.